Spoiler Alert! If you haven't read the previous book in this series, Spirit Bound , you won't want to read this review! Rose Hathaway is known for getting herself into trouble, but never anything quite like being locked up for a murder she didn't commit—the assassination of Queen Tatiana. Lissa and her friends are determined to find the real killer and bring him to justice, but when they begin to run out of time, they must orchestrate Rose's escape—with Dimitri. The plan is for the pair to lie low until the assassin is caught, but Rose isn't one to sit out on the action. She begins following the clues in a note left to her by Tatiana before her death in the hopes of helping Lissa, and fighting Dimitri nearly every step of the way. Their plans and what they discover not only change Rose's life, but alters Lissa's fate forever. 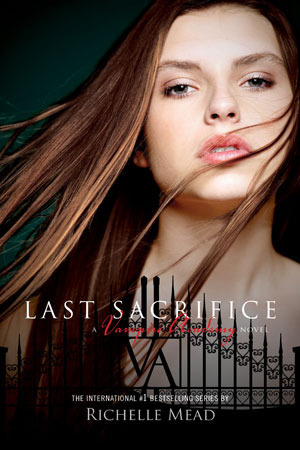 It's hard to say goodbye to Rose in this final book, but Richelle Mead gives readers one lengthy read and a final dose of everyone's favorite characters in Last Sacrifice . Rose's commentary is sharp and witty as always, and she's a fun narrator, even during the more serious moments. Despite her power and humor, she can be a little dense, a fault that makes her all the more likable. The escape plan at the beginning was full of surprises, and it really kicks off the action, which hardly slows down at all as Rose, Dimitri, and the others go racing all over the country. Mead sneaks in some new characters and groups of people, showing readers another interesting facet of the Moroi/dhamphir world not previously seen before, which just continues to solidify Rose’s world in readers’ imaginations. We also see a lot of Lissa, who is definitely not a passive character in need of constant protection, and witness a lot of her struggles and triumphs as she deals with court drama and the mystery surrounding Tatiana's death. It's great to see Lissa become a more prominent part of the series, despite the fact that she and Rose are apart, but the transitions between the two are occasionally rough, and a few of Lissa's passages stretch a little too long. Another excellent aspect to this novel is the relationship between Dimitri and Rose. As much as readers want to see them pick up where they left off in Shadow Kiss , their relationship isn't an easy fix. It's complicated and it needs time, dealing realistically with courage, honesty, and trust. In the end, Mead brings nearly every character readers have grown to love throughout the series back in this satisfying finale, but she does leave a few loose ends, which will leave readers wondering and whet their appetite for the spin-off series, Bloodlines . Cover Comments: Hm...I like this cover, but I don't love it. I love the design of the series in general, and I like the way the model's hair is blowing to the side, with the strand going across her face, but the expression on her face is just weird to me. My favorite VA cover will always be the Blood Promise one! Oh, and Bloodlines will be released on August 23rd, 2011! I agree with you on the cover, her expression looks kinda off. I thought this book was pretty good, there were some things I really didn't like, but I'm still looking forward to Bloodlines. Anyway, great review! I haven't read this one yet but I'm looking forward to it. It's so hard to choose. I love Dimitri and Rose and would like to see them work things out. But I also love Adrian. I don't know if he and Rose are as good together, but I'd hate to break the poor guy's heart. Her hair and expression really bother me on this cover. I miss the old, original paperback covers. And how she dealt with her guys....oh, I don't want to put in spoilers, but it was so powerful -and- realistic.